HexenHammer's Flame are a solo project from Russia that plays a very raw and melodic form of black metal with elements of death and thrash metal and this is a review of his 2017 album "Blood Of Death Camps" which was released by Vacula Productions. A very heavy and brutal sound starts off the album along with some thrash elements and death metal growls a few seconds later while the faster sections of the songs bring in a great amount of blast beats as well as some black metal screams also being used at times and when guitar solos and leads are utilized they are done in a very melodic fashion. Throughout the recording you can also hear a great mixture of slow, mid paced and fast parts while the riffs also bring in a great amount of melody along with some of the tracks being very long and epic in length as well as some songs also bringing in a small amount of acoustic guitars and when tremolo [picking is utilized it gives the music a more raw feeling, spoken word parts and stringed instruments can also be heard briefly. HexenHammer's Flame plays a style of black metal that is very raw and melodic along with some elements of death and thrash metal, the production sounds very professional while the lyrics cover war, winter, existentialism, transpersonalism and rejection of society themes. 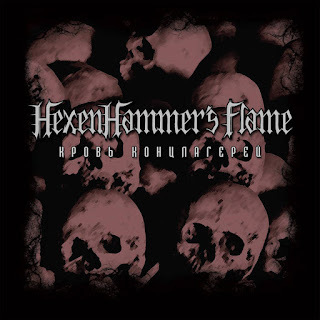 In my opinion HexenHammer's Flame are a very great sounding raw and melodic black metal project with touches of death and thrash metal and if you are a fan of those musical genres, you should check out this solo project. RECOMMENDED TRACKS INCLUDE "In The Police State" "Pitting Brothers" "Shadow of The Past" and "Majdenek". 8 out of 10.